A graph of the common logarithm of numbers from 0.1 to 100. In mathematics, the common logarithm is the logarithm with base 10. It is also known as the decadic logarithm and as the decimal logarithm, named after its base, or Briggsian logarithm, after Henry Briggs, an English mathematician who pioneered its use, as well as standard logarithm. Historically, it was known as logarithmus decimalis or logarithmus decadis. It is indicated by log10(x), or sometimes Log(x) with a capital L (however, this notation is ambiguous since it can also mean the complex natural logarithmic multi-valued function). 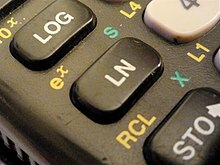 On calculators, it is usually "log", but mathematicians usually mean natural logarithm (logarithm with base e ≈ 2.71828) rather than common logarithm when they write "log". To mitigate this ambiguity, the ISO 80000 specification recommends that log10(x) should be written lg(x) and loge(x) should be ln(x). Page from a table of common logarithms. This page shows the logarithms for numbers from 1000 to 1500 to five decimal places. The complete table covers values up to 9999. Before the early 1970s, handheld electronic calculators were not available and mechanical calculators capable of multiplication were bulky, expensive and not widely available. Instead, tables of base-10 logarithms were used in science, engineering and navigation when calculations required greater accuracy than could be achieved with a slide rule. Use of logarithms avoided laborious and error-prone paper-and-pencil multiplications and divisions. Because logarithms were so useful, tables of base-10 logarithms were given in appendices of many textbooks. Mathematical and navigation handbooks included tables of the logarithms of trigonometric functions as well. See log table for the history of such tables. An important property of base-10 logarithms, which makes them so useful in calculations, is that the logarithm of numbers greater than 1 that differ by a factor of a power of 10 all have the same fractional part. The fractional part is known as the mantissa. [note 1] Thus log tables need only show the fractional part. Tables of common logarithms typically listed the mantissa, to four or five decimal places or more, of each number in a range, e.g., 1000 to 9999. Such a range would cover all possible values of the mantissa. The last number (0.07918)—the fractional part or the mantissa of the common logarithm of 120—can be found in the table shown. The location of the decimal point in 120 tells us that the integer part of the common logarithm of 120, the characteristic, is 2.
is read as "bar 2 point 07918…". * This step makes the mantissa between 0 and 1, so that its antilog (10mantissa) can be looked up.
. This allows a table of logarithms to include only one entry for each mantissa. In the example of 5 × 10i, 0.698 970 (004 336 018 …) will be listed once indexed by 5 (or 0.5, or 500, etc.). Numbers are placed on slide rule scales at distances proportional to the differences between their logarithms. By mechanically adding the distance from 1 to 2 on the lower scale to the distance from 1 to 3 on the upper scale, one can quickly determine that 2 × 3 = 6. Common logarithms are sometimes also called "Briggsian logarithms" after Henry Briggs, a 17th-century British mathematician. In 1616 and 1617, Briggs visited John Napier, the inventor of what are now called natural (base-e) logarithms at Edinburgh in order to suggest a change to Napier's logarithms. During these conferences, the alteration proposed by Briggs was agreed upon; and after his return from his second visit, he published the first chiliad of his logarithms. Because base 10 logarithms were most useful for computations, engineers generally simply wrote "log(x)" when they meant log10(x). Mathematicians, on the other hand, wrote "log(x)" when they meant loge(x) for the natural logarithm. Today, both notations are found. Since hand-held electronic calculators are designed by engineers rather than mathematicians, it became customary that they follow engineers' notation. So the notation, according to which one writes "ln(x)" when the natural logarithm is intended, may have been further popularized by the very invention that made the use of "common logarithms" far less common, electronic calculators. The logarithm keys (log for base-10 and ln for base-e) on a typical scientific calculator. The advent of hand-held calculators largely eliminated the use of common logarithms as an aid to computation. The numerical value for logarithm to the base 10 can be calculated with the following identity. as procedures exist for determining the numerical value for logarithm base e and logarithm base 2. ^ This use of the word mantissa stems from an older, non-numerical, meaning: a minor addition or supplement, e.g., to a text. Nowadays, the word mantissa is generally used to describe the fractional part of a floating-point number on computers, though the recommended term is significand. ^ a b Hall, Arthur Graham; Frink, Fred Goodrich (January 1909). "Chapter IV. Logarithms  Common logarithms". Written at Ann Arbor, Michigan, USA. Trigonometry. Part I: Plane Trigonometry. New York, USA: Henry Holt and Company / Norwood Press / J. S. Cushing Co. - Berwick & Smith Co., Norwood, Massachusetts, USA. p. 31. Retrieved 2017-08-12. ^ Euler, Leonhard; Speiser, Andreas; du Pasquier, Louis Gustave; Brandt, Heinrich; Trost, Ernst (1945) . Speiser, Andreas (ed.). Introductio in Analysin Infinitorum (Part 2). Opera Omnia, Opera Mathematica. 1 (in Latin). 9. B.G. Teubner. ^ Scherffer, P. Carolo (1772). Institutionum Analyticarum Pars Secunda de Calculo Infinitesimali Liber Secundus de Calculo Integrali (in Latin). 2. Joannis Thomæ Nob. De Trattnern. p. 198. ^ Hedrick, Earle Raymond (1913). 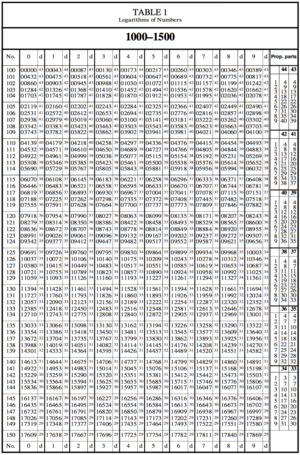 Logarithmic and Trigonometric Tables. New York, USA: Macmillan. Abramowitz, Milton; Stegun, Irene Ann, eds. (1983) [June 1964]. Handbook of Mathematical Functions with Formulas, Graphs, and Mathematical Tables. Applied Mathematics Series. 55 (Ninth reprint with additional corrections of tenth original printing with corrections (December 1972); first ed.). Washington D.C.; New York: United States Department of Commerce, National Bureau of Standards; Dover Publications. ISBN 978-0-486-61272-0. LCCN 64-60036. MR 0167642. LCCN 65-12253. Möser, Michael (2009). Engineering Acoustics: An Introduction to Noise Control. Springer. p. 448. ISBN 978-3-540-92722-8. Poliyanin, Andrei Dmitrievich; Manzhirov, Alexander Vladimirovich (2007) [2006-11-27]. Handbook of mathematics for engineers and scientists. CRC Press. p. 9. ISBN 978-1-58488-502-3.